Call owner Daniel @ 989-429-1507. 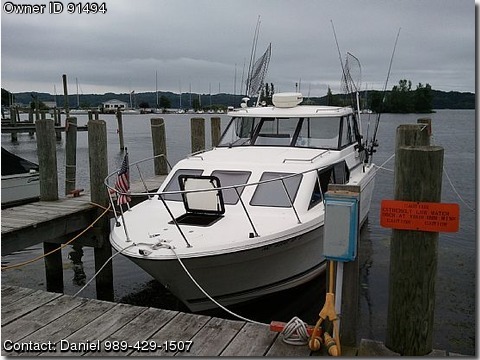 Very good condition, sleeps 6, has a full galley as well as a enclosed head compartment, and Mid-Cabin, Engine is a 454 four barrel, top speed 32 mph, cruising speed 25 mph, 10' beam. Comes with colored Raymarine C-80 GPS Radar with 4K dome, colored Furuno fish finder GPS model GP-1850WDF, Autopilot, Moor sub troll 900 temperature speed, VHF Radio, cabin cockpit heater runs off motor, Pioneer AMFM radio 100 watt, DVD player, pole holders, 2 Cannon Mag 10 electric downriggers, Classic Tri axle trailer, all aluminum galvanized axles with surge breaks. Also equipped with all Coast Guard safety equipment.